What causes tooth extraction ? The only one can decide that your tooth need to extract is your specialized dentist. All efforts should be made to aim to treatment and restore your tooth before taking the decision of tooth extraction. But, in some cases the tooth extraction is so necessary. What are the main reasons for tooth extraction? Trauma in the nerve of the tooth. What are removing teeth steps ? First Dubai dentists will see your dental history and asking about any other disease. Then the dentist will take X-rays to. definite the shape, position and length of the tooth and surrounding bone. So the dentist can decide the right way to tooth extraction . Dentists in Dubai should use a pain killer where the extraction will take place. For a simple extraction, after the pain killer the dentist uses an elevator to take the tooth out. When the dentist may choose to close the area with a stitch after finishing extraction. When should we go to Surgical Extraction? 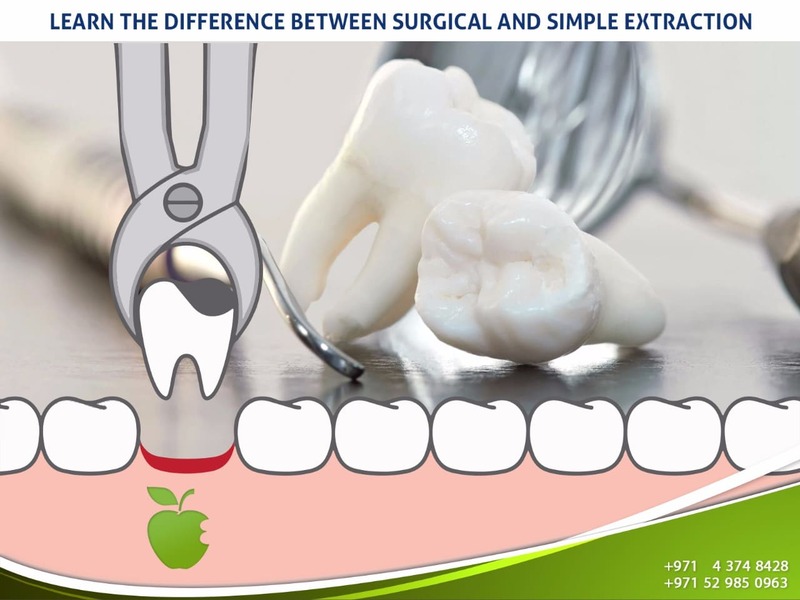 There is another way Dubai dentist use for teeth extraction which used when the tooth is invisible or burred into the gum . By taking an x-ray and examination help the dentist determine whether your extraction will be simple or surgical. But there are special cases that the dentist decide it is a simple but within the process it turns to surgical. As if a tooth breaks off during the process, it may need to be taken out in pieces. Wisdom teeth need surgical extraction because they’re not completely blew up into the mouth. In this case dentist need to cut through bone and tissue. Remove severely the broken teeth. Other examples of surgical extractions are root tips or teeth with long-curved roots. Simple Extractions :These are created on teeth that are clear seen in the mouth, the general dentist can do it by simply way, without requiring to oral surgeons. Surgical extraction :These are related to teeth that are invisible in the mouth, and can be performed by oral surgeons. Also, you have to know that type of tooth extraction may be performed through local anesthesia. You should follow your dentist instructions whatever you need simple or surgical to help recover fast and get rid of any intricacies. Stop the bleeding by using a pad for half an hour after the extraction . For the first two hours after extraction avoid much talking, eating and drinking. You need to drink a well amount of cold liquids after stop the bleeding. Start a diet with soft foods and liquids for the first day. Avoid brushing your teeth for half a day. Use a mouthwash and lukewarm water instead of tooth brush. Follow your dentist’s instructions on using any pain killer medications. Call your dentist if you have any abnormal pain or bleeding. After totally recovering you can discuss with your dentist about tooth replacement options to restore the function and beautify to your smile. Previous post: Laser Teeth Whitening. How Does It Work ?